With the film set to debut next month in Park City, Utah during the annual Sundance Film Festival, Fox Searchlight Pictures has sent out a brand new poster for the new Chan-wook Park horror film and...yikes. Check out the artwork below and click to see it full size in our database. 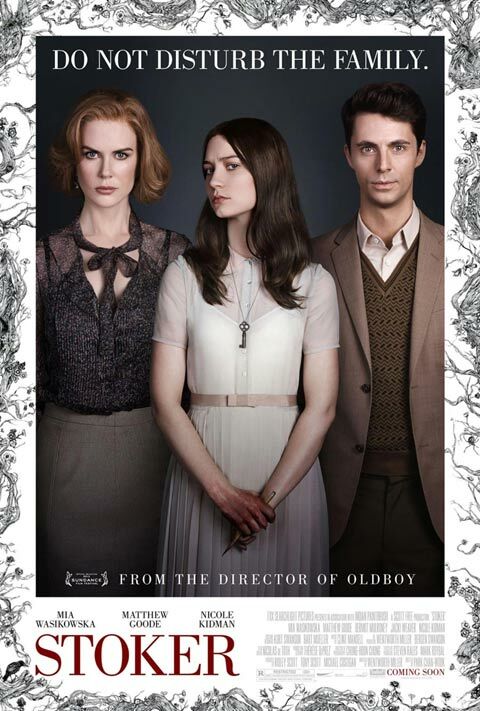 Based on a script written by Wentworth Miller, Stoker tells the story of a young girl named India (Wasikowska) who is suffering after the death of her father (Dermot Mulroney). But her time of grief is made more complicated when Uncle Charlie (Goode), a relative she has never met before, comes to town and stays with India and her unstable mother (Kidman). But who is Uncle Charlie? What does he really want? It will all come clear in the end. Following its Sundance premiere the film will be in theaters - in limited release - starting March 1st. To see more from the movie, including the first trailer that was recently released, head over to our Blend Film Database.